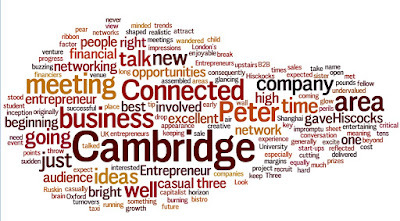 This was an event organised by Peter Hewkin’s newest successful brain child, Connected Cambridge, a high tech network of entrepreneurs, financiers and generally bright people interested in the cutting edge of business in the Cambridge UK area with links to sister networks in Shanghai and Oxford. The venue, the CB2 restaurant and bistro gave the appearance of a student meeting place and you wandered upstairs into the friendly informality of a relaxed networking meeting, the air buzzing with conversation. The projection screen was an impromptu affair of bed sheet on one wall and for the talk, the audience stood or sat in a casual circle as Peter Hiscocks delivered his presentation. An outsider glancing in would have been misled by the informal environment until beginning to overhear conversations on new company start-ups, ideas in inception and in progress, of funding opportunities beginning in the tens of thousands of pounds and expected turnovers or company sales in the millions. Peter Hiscocks talked frankly about three companies he had been involved in as an entrepreneur, where one had been a loss, a second a break even and the third a very profitable sale. It was this view of being an entrepreneur, with its peaks and troughs that was fascinating for the audience; here are a few of the impressions and titbits of information we gleaned about being an Entrepreneur. Sell the business at the right time! But how do you find the right area? You create your own opportunities by looking for new growth areas with financial potential and finding ideas that fill an up and coming need. This means keeping an open eye for any trends and ideas as well as brainstorming with equally minded people. Your business plan should be able to excite the investor as well as being realistic – the latter meaning that you should expect it to cost twice as much as originally budgeted and take three times as long. Your assembled team is critical – a factor seriously undervalued by many new startups. Make your business exciting so that you attract the best who have consequently a burning desire to be involved – especially as the early phases will be hard work with the rewards on or just beyond the horizon, some time away! And how do you know if things are going pear shaped in your market? Here’s Peter’s tip from London’s financial industry: If taxi drivers experience a sudden drop in fares in the area, its time to sell your company! Apart from the excellent talk, there was also the enjoyable networking afterwards and I met bright minds from Jordan, from the creative network in our area, a venture capitalist and fellow communicators for B2B, just to name a few. I reflected on an excellent meeting with a warm glow as I followed the silver ribbon of the Cam river path, cycling home in the gloaming on my traffic busting bicycle in true Cambridge fashion. Look out for future Connected Cambridge meetings, I know I will.